Hi, Readers. I don’t know how it is in your neck of the woods, but up here we’ve come to the end of the first full week back in school after winter vacation. After lapsing into my preferred sleep schedule of approximately 11:30 pm to 7:30 am for two weeks, shoehorning myself back into the necessity of rising at 6 am has produced predictable results. I’m tired. I have insomnia. And because I’m tired and have insomnia, I’m also worrying about whether I have, say, a small arterial dissection that will cause me to collapse while driving children to or from an event from a bleed into my brain. You know, that kind of thing. Perks of being married to a neurologist…. I know just enough – and not enough at all. I just returned home from purchasing tickets to the middle school musical. Advance ticket sales, don’t you know. The 6th grader is in the chorus as a jungle animal. I’m supposed to do make-up for the show, but naturlich we have schedule conflicts. The 10th grader has to go to NYC for several auditions for summer ballet programs and of course they conflict with the middle school musical and its dress rehearsal. But not to worry. Perhaps that arterial dissection will take care of everything. Anyhoo, as I was saying, I just returned home. There I discovered the dog licking peanut butter off of the side of a cabinet and from a wide swath of kitchen floor. 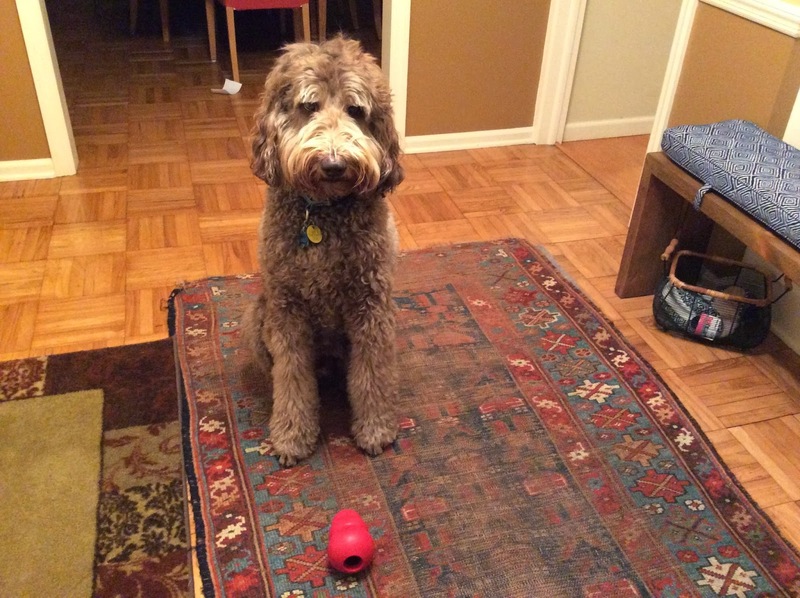 The 10th grader was supposed to give him his Kong with said peanut butter before she left for dance. The question is, how did it get from the Kong onto the cabinet? Did she hurl it? The Kong I mean? These are mysteries awaiting clarification. Otherwise, all my news comes from the media, and only a little bit of it relates to success. Today is the 10th anniversary of Spalding Gray’s disappearance that turned out to be his death by suicide. I used to love Spalding Gray. He was so funny and original. I saw him in San Francisco. I had a fever, but I went anyway. Sorry audience members on whom I breathed. He was an inspiration to me. I thought perhaps I had a way to tell something autobiographical, too. Perhaps on stage. I took some improv classes. Then I decided it wasn’t such a good idea to become too worshipful of or fascinated by people who are depressive and neurotic. On edge. Obsessive. Narcissistic, perhaps. People who are involved in their own problems. Who are open about them. Who turn pain into humor. On a totally different subject, did anyone else read that piece in the Style section of the New York Times on Martha Stewart’s beauty regimen? That lady has been to jail and back. She’s got some stunning self -confidence. Or something. Not sure what. Maybe it’s another c-word. Shut up, I mean cahones, Readers! No, I guess she doesn’t have those. But I think my sister-in-law may be right, I ought to start getting facials. Martha’s been doing it for forty-five years. I just use my tube of prescription retin-A cream. And sunscreen. I don’t have to worry about putting a sunhat over my riding helmet, as Martha does, since I don’t ride. Not since old Taffy, at sleepover camp. There’s a terrific picture of me with a glorious Morgan. I’m in my glory, too: gold granny glasses, braids, braces, and a t-shirt with bottle caps on it. The horse was a marvel. I never rode her. She was too lively. I preferred Taffy. Aptly named. Or she grew to embody her name, as some people do. She was twenty-eight and so slow she wouldn’t even take a step unless you showed her the switch. Are you still reading? Well here’s a little bit on success. Yesterday I went to NIA class at the Y. After class I fell into conversation with the instructor, who’s a friend. We were standing outside the locker room when another friend came out of the locker room. So the three of us stood around for a good while chatting. I felt happy and knitted in to a community when I left the building and headed into the cold for my car. On the radio someone was talking about research on nostalgia. Apparently, research shows that nostalgia creates feelings of connection to others and that connection to others promotes self- esteem. How serendipitous. I was a living example. Yes, I thought, connection to others does promote self-esteem. And self-esteem is key to feeling successful. I'm distinguishing between feeling successful and appearing successful, which can be two different things. I’m not saying you’ll never achieve anything, self-esteem or no. Plenty of people who are empty inside try to make themselves feel better by becoming public achievers. However, if you don’t feel you have value as a being, then no amount of achievement is going to penetrate and make you feel good. There are a couple of distressing implications of this new report. For one - apparently - it suggests that if you have a sense of connection to others, and therefore healthy self-esteem, then who needs achievements? You can revise your novel for twenty years, or keep writing those stories that you file away in a drawer and it doesn’t matter. ‘Cuz you have fwends. Furthermore, if all you need to feel you have connection to others is to delve into nostalgia, then who needs actual friends? You can just pull out those old yearbooks and remember the people you used to know. Dear me. I seem to have unraveled something positive. But let me not shy away from Spalding Gray and my fascination with miserable wretches. My love affair with the messed up and depressed. Eventually I realized that hooking myself to these folks in pursuit of a creative identity was a dead end. I grew wary. Much as I admire his honest and humorous self expression, I don’t want to be like Spalding. A person who couldn’t take comfort in his connections. He made me feel connected to him; but he had trouble connecting to others. He was successful in art, but not in life. That’s not a trade off I want to make.